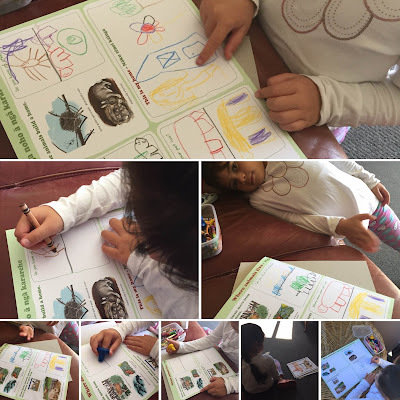 New resources came in from school on Saturday and the subject is: Animals. I asked last year for them not to send anything with snakes in or anything involving snakes. They sent two books that had whole page images of rattlesnakes. I put those away. We won't be using those at all. Knowing they're in my house makes me neurotic and I put the books in a plastic bag that went into another plastic bag and into another bag .. just in case the snakes turned real and slithered into my bed. Don't judge me .. ish like that happened in the bible. I went to the Parentals this morning because all the animals are there. We were going to observe what the animals did around us. Where they slept, what they ate, how they looked for food etc, but then I got stuck listening to a visiting Aunty who raved on for an hour about Maori Land Court. I would have preferred the snake in my bed. We got an assignment done nonetheless and Hubs was able to answer questions about animals. Some animals move from place to place. Can you think of some? She remembered the salmon swimming up stream from Alaska: The Last Frontier and wild pigs from Uncle Jestons stories about hunting and chasing the pigs as they move around. Some farm animals and pets have homes we give them. Where does your pet live? Winston lives in Papa's shed (and it's a disgusting thing) and Snowflake lives under the palms at Ma's house. Some animals build a home: Do you know of any? Shaily-Fish got her teeth blinged this morning. She'll have those babies on for a few years. I call her waha (mouth in maori)-bling(flashy jewelry in homie). She was always a waha, I just added the bling. Baby #6 came last Wednesday. I have no photos but he was big and juicy and they named him Luca. #7 will debut in June.